More and More organizations are beginning to understand the importance of an employee advocacy program. Especially when it comes to increasing visibility and preparing for the needs of a highly connected world. However, the road to creating a successful advocacy program can be rocky. Last week, we discussed three of the top pitfalls that can dog any employee advocacy program. 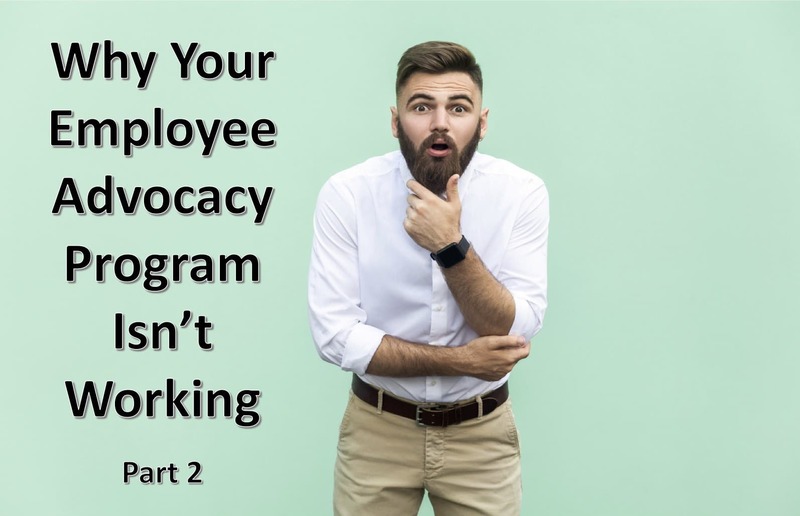 This week we continue to explore some of the biggest obstacles to launching and sustaining a successful employee advocacy program. Employees won’t participate in a program that they know nothing about. You need to promote your program both before it launches, and continually throughout its lifespan. Sending out teaser emails and launching a pilot program can help create buzz around your program before you do a company-wide launch. Teasers will garner interest; while your pilot participants can help get more reticent employees on board through demonstrating the ease and benefits of your program. However, once your employee advocacy program is launched, you can’t rest on your laurels. You need to internally promote it on a continual basis as well. Remember: the attention of your employees is split among different tasks. If your program isn’t promoted it becomes easier for employees to ignore or forget completely. Additionally, your employee advocacy program must be seen in order for your employees to prioritize and invest in it. Using an employee advocacy platform that makes internal communication simple, is an easy solution to any visibility problem that may arise. Platform functions such newsletters, allow you to send regular updates and reminders to post with ease. Additionally, you can tap into gamification tools and promote the campaigns you create. Promoting campaigns and challenges allows you to bring visibility to your program without it seeming as if you are continually pushing your employees to post. Now that you’ve started promoting your program, you need to be able to track its success. Being aware of and understanding your numbers allows you to see what parts of your program are working and what parts are struggling. Tracking your numbers can seem overwhelming, and many organizations aren’t sure what to measure. To simplify the task, and eliminate guesswork, you can try using a platform that gives you the tools to measure your program analytics. The wealth of information provided by such a tool can help you understand what types of content are the most engaging, how employees react to certain incentives, and the impact on your brands overall reach. Building a successful employee advocacy program takes time and work. It is also a continual process that requires promoting and measuring. But, by making it a regular part of your organization’s activities, promoting its use, and tracking what works; you will create the foundations for a program that will offer continual success. To learn more about how to build a successful employee advocacy program join us on December 5th for our next webinar: “Top 10 Employee Advocacy Mistakes and How to Avoid Them”.